O’Brien loved people, loved drawing and painting portraits and ensembles of figures and telling stories through time-honoured themes. He illuminated through a deep biblical knowledge basic questions of the human condition played out like a sort of timeless medieval procession. This long-awaited survey celebrates the life’s work of a much-admired Australian artist, Justin O’Brien (1917-1996). 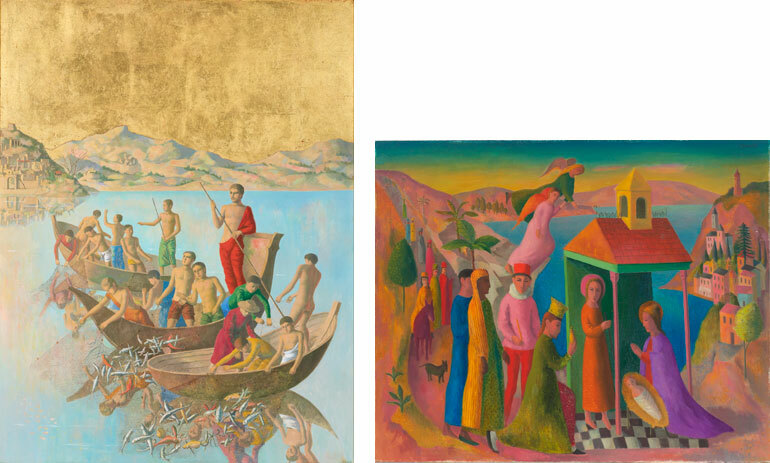 O’Brien is best known for his colourful and exuberant depictions of religious themes inspired by his biblical knowledge and the faith from which he had drifted and to which he later returned. He was the inaugural winner of the Blake Prize for Religious Art in 1951 and his painting The raising of Lazarus was acquired by the Vatican. This exhibition will also reveal a number of other key aspects of O’Brien’s work: his commanding use of colour and form and the sumptuous detail of his still lifes, portraits and landscapes. Many of his portraits are of students, painted during his 20 years as art master at the Cranbrook School in Sydney, and of fellow prisoners during his internment in Greece and Poland in World War II. They portray the remarkable story of compassion and respect shared between the artist and the people he encountered throughout his life. Justin O’Brien: the sacred music of colour is the first major retrospective of the artist’s work since 1987 and the first since his death. Presenting over 90 paintings, watercolours and drawings, some of which have not been seen in public for more than 60 years, it brings to light works of intense beauty and harmony. The exhibition will be accompanied by an exciting program of events. Join us for daily guided tours and Wednesday evening talks in the exhibition by artists and curators that will showcase O’Brien’s life, faith and art. In a special lecture series, guest speakers will discuss the history of the Blake Prize and religious art in Australia and uncover the Renaissance motifs that inspired O’Brien. Alternatively, indulge your spiritual side on Friday mornings led by the Australian Christian Meditation Community – bookings essential.